There are 205, beatified by Pope Pius IX on 7 May 1867. They are a mixture of 74 Ordained – Augustinian, Dominican, Franciscan and Jesuit (both Foreign and Japanese) and 131 Laity, all but one, Japanese nationals. 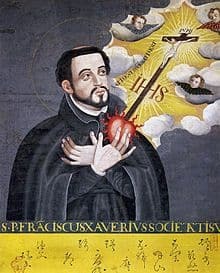 In the 1540’s, St Francis Xavier brought Christianity to Japan and for a short time, it flourished. However, rulers started to perceive it as a threat from colonists, having watched countries like the Philippines being taken over by the Spanish so, they banned Christianity and persecuted Christians. Before the religion was forced underground, many of its prominent leaders and workers lost their lives. Imprisonment, torture, beheading, spearing, burning on pyres and crucifixion were among the terrifying punishments handed down. Neither gender nor age was a defence, children as young as 12 were martyred. These 205 martyrs are but a small number of the perhaps thousands who were executed for their Catholic faith. When religious freedom was reestablished in 1873, many thousands of secret Catholics were discovered. The Feast Day of the Martyrs of Japan is the 10th September.